Written on 15 October 2018. 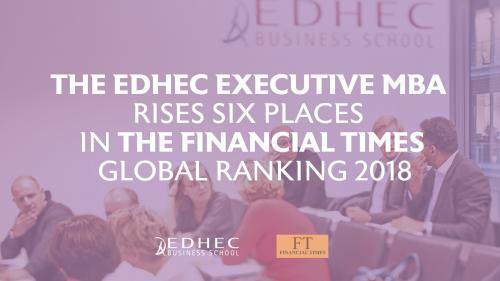 The Financial Times published today its latest ranking of top Executive MBA programmes and positioned EDHEC 80th worldwide, up six places from the previous year. These results testify to the efforts made by all the EDHEC teams involved to offer executive managers and entrepreneurs enrolled on the programme an exceptional learning experience, i.e. an action-learning based approach, a broad choice of electives focused on relevant business issues, e-learning courses to facilitate learning and access to an extensive network of decision-makers throughout the world. The accelerated development of the EDHEC Executive MBA in Lille then in Paris in recent years has made the programme a prime choice for French and international executives and business leaders looking to inject fresh momentum into their careers and better steer the performance of their companies in a fast-changing environment. Next intake: February 2019 >> Places still available! So why not send us your CV so we can discuss your career plans and objectives together.